Three Down, One or Two to go? Just a short second post today as all eyes will be on the TD, with supporters frantically F5ing every source of news they can find. Who knows how much of a spur the 8:2 ‘humiliation’ was to the powers that be at Arsenal, but one thing is for sure, the 3 signings that have followed in quick succession have at last shown that we are serious about producing a team that can compete with the best this season. After having highlighted the defence as our weakness yet again this summer, Arsène has finally done something about it. Mertesacker and Santos tick the quality, experience and size boxes. They’re both seasoned internationals and are proven winners. At 26, Park Chu Young must also be entering his peak years although it is thought that we will only have him for 2 before he returns home for national service. He is the captain of South Korea and also brings experience as well as goals to the side. So is that it? Are we done? Well I hope not. We know that Cesc was irreplaceable, but from the ashes of the team that was built around him can rise a new more direct Arsenal that would owe more to the Invincibles than the team of recent years. Santos is a very attacking fullback whose record is 1 goal in 5 for Fenerbache – A’Cole’s record is 1 goal in 30. Gervinho and Park are also very quick and have an eye for goal so all of a sudden we have the potential to score from all angles. All we need now is the midfielder to unlock defences with that killer (dare I say Cesc-like) pass. Will Jack be promoted further up the pitch to fill that role? He certainly has the vision and passing ability, but his young frame was overplayed last season and he is paying the price now. Ramsey already looks exhausted and in need of support. I would be happy with one more signing in midfield, but time is running out and candidates of real top quality are few and far between although there are seemingly plenty of names in the mix – add Fellaini and Dempsey to those already identified. The news that we have been linked to Honda this morning adds his name to a list that still includes Hazard (the preferred choice of many) and M’Vila who would certainly add strength but is more defensive in his play. I’m greedy, I’d like the power of M’Vila and the craft of Hazard, but I don’t expect that will happen. Hazard is going nowhere I suspect. Honda will bridge the gap between the two in some way so maybe he will be the answer. We’ve probably done enough to ensure we will be in a strong position for the rest of the season, but wouldn’t it be nice if we just made that last flagship signing that really showed our intent. One thing is for sure, we are now in a far better position than our North London rivals and we will have some great new signings to light up the Emirates pitch and hopefully get the fans singing this season. Well done Arsène, 3 rabbits out of the hat – just one more would be nice. The departures of Clichy, Nasri and Cesc this summer have shocked us all. Just when ‘Project Youth’ started to deliver on its promises, some of the most valuable assets are sold for hard cash to a major domestic competitor, and a European competitor. It is so much harder to build a club’s strategy around youth development than it is to buy fully ripened and proven top quality players every year. It is also absolutely paramount not to sell your top players when they start to hit their peak, if your strategy is based around growing talents from within. Yet, Arsenal did just that: not because the club wanted it, but simply because it had no other choice as a result of bad contract management, and a clear lack of loyalty to our club by those particular players (Cesc included). Looking back towards the end of last season, we can now see that a significant number of our players had made their mind up about leaving Arsenal during that crucial – and oh so painful – period. I cannot prove it, but my gut instinct tells me that after that feeble surrender against the Mancs in the FA-cup last year – which for me was the defining game of our 2010-2011 season – a number of players started to plan their exit strategies, and the morale amongst the entire squad was heavily influenced by it. 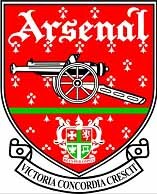 We should have finished at least third last season, but too many players showed no loyalty to Arsenal: they did not seem to care anymore, and it cost us dearly. They clearly let Arsene and the fans down, and it should come as no surprise to a number of players who left us this summer that they will not be welcomed back, if and when they return to the Emirates. This brings me to the two topics I have always been interested in, both in football and in my professional life: leadership and loyalty. To be successful in football, you need more than just leadership and loyalty, but for me these two will become paramount for Arsenal in the next few years. In this post, I will focus on loyalty and I will cover leadership in another post, in the near future. Every football team needs loyal players. Loyalty, in my opinion, consists of both a real desire/passion to give their all for our club, and a willingness to spend most – if not all – of their playing career at Arsenal. The key thing for Arsenal is to find the right mix between ‘Stayers’; those who have a passionate commitment to give their all for the club and over a long period, and ‘Contract Footballers (for a lack of a better word)’: those who have a more calculative commitment. Some players are pure professionals and can be loyal and dedicated to any team they play for. They can be very useful to a team as well. They will give their all during the time they are at a particular club, but will do so again for any next club they move to (Overmars, Gallas, Robben, etc). Understandably, not everyone likes to stay at one and the same club either. Both ‘Stayers’ and ‘Contractors’ need to be fully committed to the team when they play for us, but it is really important to have as many quality Stayers in our spine as possible. The current spine is starting to look awesome: Szczesny – Vermaelen/Koscielny – Song – Wilshere – RvP. We really have 6 players in our spine of high quality, around which we can build the best team in the England and Europe for the next 5-10 years. On top of that we have Sagna and Walcott, and a number of promising young players and new recruits, and surely a couple of quality players will be added before the end of the TW. Question 1: How many of our current players are to be regarded as loyal, as Stayers – especially in our spine? I believe that we are now left with a set of players who are mostly loyal to the club. That does not mean that they will never leave us if they were to be offered a lot more money somewhere else, but in principle they love playing for us and would like to be successful with us. I believe it would take quite a bit for any of them to ask for a transfer request. This bodes well for the future of Arsenal football club. Question 2: What do we need to do to recruit more quality Stayers for the future and to entice them, as well as our current ones, to our club? I strongly believe that Arsenal needs to focus its recruitment of key players more on nations were players are used to relatively harsh/wet winters, and the British ‘way of life’. Germany, Holland, Belgium, the Scandinavian countries and to a certain extent France, are good recruitment grounds. Countries like Spain, Portugal and (southern) Italy are best to be avoided. Reyes and Cesc come to mind, who both wanted to return home, as a result of a form of homesickness. I also believe we need to reward loyalty more by offering good players who reach the age of 30+, better and longer contracts than we currently do. We let the likes of Pires, Vieira, Gilberto, etc go as soon as the club believed they were past their best and so we could save money, but this also gave a signal to other, younger players that the club does not really care about players that much (so why should they be loyal to our club?). Question 3: What do we need to do to protect us from clubs like Barcalona and Citeh to come and cream off our players and the end of every season? to avoid a repeat of the Nasri situation, and would give a clear sign to our competitors – as well as our own current players – that we are no longer prepared to let our best players leave to them. Most importantly, Wenger and the BoD need to (re)convince the players (and supporters) that we are to remain a major force in football – that Arsenal is going onwards and upwards from here on, so that everyone is passionate to stay at the club and give their all. Loyalty is a complex issue, and I do not pretend to have all the answers to the above questions. However, I hope this post will start a good discussion on how we can establish more loyal and committed players at our club, who will stay with us and help us to win major prizes again. Today’s post was written before the late night news that we are in the process of signing Brazillian left back Andre Santos. This is a huge two days for Arsène Wenger and Arsenal. At the time of writing, no further signings have been announced despite speculation linking us with Leighton Baines, Alex, Kaka, Andre Santos, Yossi Benayoun and the usual suspects like Cahill and Samba. So, here we sit, still in shock from the most humiliating thrashing of any Arsenal team in our lifetimes; anxiously hoping we sign somebody – anybody – to lift the spirits. Regular readers will know I lean towards a generally optimistic view of Arsenal under the stewardship of Arsène Wenger. Lately my optimism has taken a battering. It’s now as fragile as a Kieran Gibbs hamstring. It’s feeling a bit Traore (pulled all over the place) with a dose of Jenkinson thrown in (twisted inside out). And it’s even going all Arshavin (lumbering about pointlessly in a half-arsed way before having a little rest). It needs to pick itself up and get back to being Vermaelen again (powerful and confident). One thing that would help my optimism would be for Arsenal to finally, belatedly do what the manager promised us all at the end of last season: sign experienced players who can move our team to the next level. Because right now the worry is that we have moved to the next level – but it’s the next level down, not up. Today, with the 8-2 defeat still inflicting the sort of afterburn normally associated with a late-night vindaloo, it’s hard to avoid feeling that the two Manchesters, United and City, have moved significantly away from us in terms of playing quality. We may yet keep pace with Chelsea and Liverpool – time will tell – or we might find ourselves sucked down to the level of Aston Villa and (dare I say it) the Spuds. Our results since the Carling Cup Final do not make pretty reading – we have won two out of our last 14 competitive games. But we still have most of the players who were good enough to beat Manchester United and Barcelona last season (let’s not forget how heroic the likes of Jack Wilshere and Laurent Koscielny were in the Barca game at the Emirates). This can still be a good season – maybe even a trophy-winning season – but only if reinforcements are brought in. Never mind “super quality” – we just need solid, battle-hardened professionals who can provide a platform for our super quality youngsters to flourish on. No matter how much Arsène believes in his young players, it’s clear that the whole squad needs a massive morale boost. There is a real fear that a drubbing like Sunday’s will harm the development of some of our talented young ‘uns. They need older shoulders to lean on and they MUST be brought in. Arsène promised he would do it early. Unfortunately he didn’t tell us that his idea of “early” was a bit like the Americans’ idea of “early” in helping us out “early” in the two world wars. If he buys well, he can have the last laugh (and God, after the flack he has taken, how I would love to see him holding up some serious silverware at the end of this season). If he does not, there is a real danger that no BUY BUY will mean BYE BYE – possibly sooner than any of his loyal supporters might like to think. As most of you know I like nothing better than looking for positives in an Arsenal performance, I also like to give our players credit where it is due, unfortunately following the display yesterday it is very difficult to do either. That is not to say that we had a strong side out, it was probably the weakest eleven we have fielded at Old Trafford, maybe ever under Arsene Wenger. It was certainly a lot weaker than a side which was roundly dismissed 6-1 back in 2001. That side was Seaman, Luzhny, Cole, Grimandi, Stepanovs, Pires, Viera, Parlour, Silvinho, Wiltord and Henry, admittedly they played a full strength United with exception of Cole and Giggs. Compare that team to the one that took the field yesterday and perhaps the result looks better. I stated on Twitter yesterday at half time, and maintain now that add Gervinho, Wilshere, Vermaelen, Song, Sagna and Gibbs into that side and put Rosicky, Coquelin, Jenkinson, Arshavin, Djourou and Traore into the squad and the team looks a lot healthier and the squad a lot thicker. It has often been said that we have lacked a spine in recent years, yesterday it was till absent along with a couple of limbs and very possibly a heart. We took the field with a team that had only two combinations that plays regularly together (Theo/RvP/Arsh and Kos/JD/Sz) around them and in between them were inexperienced or untested at this level players. That side from 2001 was missing one combination (the Centre Backs and Right back) that was painful enough, now take out Pires, Viera and Parlour and you get something like the side we put out yesterday regarding cohesion and familiarity. It is possible to carry maybe one or two players, not at Old Trafford necessarily but it can be done, to carry six is a very big ask. The game started badly for Arsenal, United were chasing everything at high tempo and forcing the defence and midfield to rush passes which were easily picked off by United’s midfield and defence. To give credit to United they got a feint whiff of fear and went for the jugular. The warning signs were self evident, after another uncontested long ball was won too easily by their defenders two quick passes later and Wellbeck was racing into space, Koscielny did very well to catch up and deny a clear shooting opportunity, minutes later and Coquelin was forced into tidying up when Young looked poised to shoot. Despite these moments no one on the pitch in blue was capable of taking charge and just putting laces through the football for ten minutes or so, continually trying to pass and retain possession as is Wenger’s methodology rather than realising that we just needed to fight for possession and do everything possible to quieten their attacking endeavours, if this meant turning their back four and letting Theo chase lost causes then so be it, better than presenting possession in our half every time we lost the ball. It came as no surprise when United opened the scoring, following more sloppy defending and failure to properly clear lines Anderson received the ball on the edge of the box and lifted a ball over the back four to Wellbeck who outmuscled Djourou and headed in from close range. The worst thing about this goal was the fact that the ball bounced before Wellbeck headed it home, as the ball bounces Djourou is trying to hold off Wellbeck whilst Koscielny is waiting for him to deal with it, I don’t think Szczesny can come and get it as the ball bounces on the penalty spot. He could have dealt with the ball after it bounced better but the fact remains it should never have been allowed to bounce and that is after all the first law of defending. Five minutes later Johnny Evans pulled down Walcott and gave us a chance to get the match back on level terms. Unfortunately for the team and us fans Mr Reliable became Mr Sitter (sorry). I don’t think I have seen Van Persie strike a ball so weakly from open play let alone from a dead ball from 12 yards out. The penalty was so weak that even if De Gea had waited for the ball to be kicked before deciding which way to go he would have been able to save it. As all good teams do United punished our profligacy from a nothing ball into the box Traore could only head the ball into the path of Ashley Young, he picked the ball up Coqeulin got close and he shifted the ball and unleashed a super strike from 23 yards out, as expected of a midfielder Coquelin gave Young very little to aim at but he conjured up an impressive strike that no keeper would stop. The game continued to be very open, in fairness we were looking beaten already. With five minutes of the half remaining Jenkinson trying to compete for an aerial ball was naive. Young ran across his path and bought a cheap free kick. Up stepped Rooney to bend a pearler into the top corner. Just before the half time whistle was sounded to give us a relief from the pain an uncharacteristically poor clearance from Evra was won in the air by Ramsey, Arshavin played to Rosicky he picked a lovely pass to Walcott who finished quickly between De Gea’s legs. By half time in 2001 we were already 5-1 down, could Wenger work some magic to make this group of players believe that they had a chance still? With the Arsenal fans giving a heroically tragic twenty minute rendition of “We Love You Arsenal” at the start of the second half things looked a bit brighter, we enjoyed some possession, and were at times dangerous going forward, the problem was United could now resort to their normal default setting against us of soaking pressure and counterattacking. In that period Arshavin managed to miss the target when easier to hit it, Van Persie had a fine volley saved by De Gea. Admittedly United were still creating chances and Szczesny was called upon a number of times to keep the score respectable. Wenger obviously thought Coquelin was looking tired or wanted to try to add something different and introduced Oxlade-Chamberlain for his Premier League debut. Soon after Djourou was deemed to have fouled Rooney off the ball, Rooney picked himself up to curl the ball into Szczesny’s side of the goal from the free kick. This is the only goal I will lay at the feet of our keeper who I thought performed well in difficult circumstances, shifting two paces to his left gave Rooney an enormous target to aim at and he didn’t need inviting twice. That said the wall was rooted to the floor. Unfortunately that let the floodgates open again and soon United were 6-1 up, Nani cooly finished having found himself in acres of space in the eighteen yard box with Traore and Jenkinson both five yards behind the centre backs to make it five. 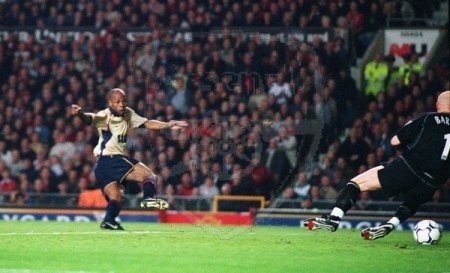 Number six came soon after when Ashley Young picked Park out and he in turn found the bottom corner with his shot. Amazingly there was still time for more goals, at least the next was one we could cheer, Arshavin dropping deep played a searching ball that the ever willing Jenkinson ran on to before delivering a good cross which was headed away, Jenkinson was first to the second ball and headed it back across the box for Van Persie to smash home a consolation, if only he had struck the penalty so true. The task of damage limitation was made harder when Jenkinson received a second yellow for a foul very similar to that in the first half, this time Hernandez cut across him and Jenkinson was over eager, tangled legs and received his marching orders. Jenkinson was found out of his depth today, but I will say one thing in his defence he does not hide, he works tirelessly for the team and I still think we will see better from him. Walcott was forced into playing right back and was soon nibbling at the heels of Evra and allowing Webb the chance to award the obligatory penalty to United at Old Trafford, Rooney wanted his hat-rick and stepped up and smashed it home. Unfortunately there was still time for Ashley Young to pick out the top corner again in the ninetieth minute to complete the rout. We were played off the park, as we were in 2001, the blog world was not as prevalent then as it is now, most of us only had dial up modems, but how would todays blog world have reacted to that one? Would Wenger have been demanded out? We would have surely missed out on two more League titles, three FA Cups and a trip to a Champions League final. All achieved after Wenger’s last darkest hour. Should we expect Wenger to send a team to take the field playing two banks of four and go for the draw? Thats not in our make up as a squad, we fans criticise the big clubs for coming to the Emirates and doing the same, would be a bit hypocritical to encourage him to do it now. Fact remains at 1-0 we could have made it 1-1, at 3-1 we could have made it 3-3, we didn’t. Some of the players that let the team down today were those more experienced the ones that you need to help the younger players out, but with so many missing pieces of the jigsaw it is almost impossible to expect the side to function anywhere near its best, remember Wigan away last year? Wednesday certainly seems an eternity ago, are we at rock bottom? Probably in the Premier League. Can things get better? Most definitely, with suspensions ending soon (Frimpong back for Swansea, Song and Gervinho back for Blackburn away) and hopefully some news about Wilshere and Vermaelen returning to the side sooner rather than later we should be in position to start winning games again very soon. I still remain excited by the possibilities of line ups that our full squad can produce. Has ill discipline cost us 6 points? In truth Song/Gervinho or Frimpong/Gervinho would not have made a massive difference today, and I’m not going to be angry at Gervinho for slapping Barton, or Frimpong for being enthusiastic, I will criticise Song for petulance though. Has Wenger got the desire to do it again? I hope so, if he decides to walk, I have serious doubts over what we as a club will achieve this season, this assembled group will play for their Manager of that I am certain. I’m not sure another manager would get instant results with this group of players so to change now without anytime to bring in players would be madness. Are our away fans the best in the Premier League? Absof***inglutely and they deserve better than yesterday for their support. Seems like a long time ago since Mr Wiltord ensured another title for the men in the white hats. It would be reasonable to say that whilst United have consolidated and strengthened, we have taken a step back. The reasons have been discussed ad nauseum across the AFC blogworld, we all have our theories and pre-match is not the time to further the discussion. Rarely have I known Gooners go into a PL game with so little expectation, actually that’s not true – there is an expectation – we are goimg to get hammered. Why? …. oh, there are so many reasons for the lack of optimism: Recent history at OT, injuries, suspensions, exhaustion, inexperience, players out of their natural positions etc etc etc. BUT …..
Where MU undoubtedly have an advantage is with the officials. However MU fans may like to suggest otherwise the facts point to an undoubted bias towards MU at OT. Since the beginning of 2009 – over 2 seasons, only one penalty has been awarded to the opposition at OT, whereas 8 were awarded to MU ( Arsenal stats for Emirates AFC . For 9, against 8). This is before dodgy offsides, non-goals, cards given for an MU dive, 110 minute games etc. This bias is so prevalent that it has become accepted by everyone outside of OT. Harold Webbis today’s victim, let us hope he has a good game. This is a huge game in our calendar, one of the highlights of the season and whomever AW decides to play, they will give their all. We have match winners despite our problems and despite the shuffles , the defence looks sound. Suggestions have been made that Djourou could play in midfield …. seems a reasonable shout, better than throwing Lansbury into a massive game. Our record at Old Trafford has been poor in recent years, no win since 2006, Furthermore, United have not lost a home PL game for 17 months! The Manc blogs are united in their optimism – most predict a home win by a least 2-0 and a comfortable victory. It is true that MU have started the season very well, the seond half against a sub-standard Spurs was an exhibition of superb attacking football to which the cave dwellers had no answer (and still have no points). But …… our win in Italy was founded upon a determination which has rarely been seen in the squad since Sol and PV left. We are expected to lose yet we have real firepower in our front line, hard workers in our midfield and a beginning of a solid defence based around a superb goalkeeper. Should we score first, I rate our chances highly. Either JD or Kos could play as DM. They both have shown an eye for a pass and the ability to get forward. Just read there could be a problem with Sagna, in which case, Lansbury has to play MF and Koscielny can go left …. tough times! There have been many inventors from Manchester, my favourite being Roy Chadwick who designed the Lancaster bomber as well as the Vulcan bomber upon which Concorde was based. Chadwick died in 1947 testing one of his own designs. A question was posed midweek …. which game would we rather win, Udinese or MU. Almost everyone said the CL match. I disagree, I want to win both. As all football fans(except those of a pale blue Mancunian inclination) have looked in incredulity at the sustained, profligate transfer policy of the Abu Dhabi Royal families current toy(namely Manchester City) more and more of us are speculating on the impact, if any, of UEFA’s Financial Fair Play(FFP) rules on the modus operandi of Manchester City. Since the takeover by the current owner, Sheikh Mansour Bin Zayed al Nahyan to give him his full name, in August of 2008, the (Middle) Eastlands outfit have spent in excess of £450million, and that is with this current transfer window still open and petrodollars at the ready. Clearly all these transfers will come with an attached wages commitment and while players have left the general trend is for higher and higher wages to be offered to players coming in at higher and higher transfer fees. This is the first of three seasons in which FFP will be used by UEFA’s finance team to evaluate the financial performance of all European clubs wishing to take part in UEFA competitions with permitted deficits being £37million in years 2011-12 & 2012-13, and allowable deficits being £22 million and £11million in the next two years and a break even requirement in the following year. The losses are only allowed if those deficits are funded by an injection of equity from the club’s owners, a share issue for example, like the Arsenal fanshare scheme that started last year. “But what defines these losses?” you ask, if you’ve not all switched off at the merest hint of accountant speak. A good question as UEFA do not merely intend to look at audited accounts, but at a statement of relevant income and relevant expenditure, using figures extracted from the financial statement by the clubs management. Already there is a grey area as the definitions of “relevant income” and “relevant expenditure” are not exhaustive and therefore open to a degree of interpretation. To further lessen the worry for any clubs worried by the potential impact of falling foul of the FFP regulations merely showing a trend of falling losses will be sufficient to avoid penalty especially if the losses can be attributed to contracts signed before June 2010, for example the huge contracts used to lure Carlos Alberto Tévez across Manchester and everyone’s favourite Togolese striker. A major sticking point for relevant income is that of “related parties” and their influence on market value, perfectly exemplified by the naming rights “purchased” by Etihad Airways for the council property the trillionaires of the Middle East play their football in. Currently UEFA have promised to gather some fair value benchmarks for naming/sponsorship deals but straight away this looks hard to define – how much more is the brand of Manchester City worth than old Bacon faces club for example, or Liverpool or even us ? If the deal had been undertaken by unrelated parties then alarm bells wouldn’t have rung but as both Etihad and Manchester City are owned by the Abu Dhabi royalty then we cannot be expected to beleive that market value had been used in the deal. The club with the most cache in terms of world wide appeal is a club which neighbours Tarragona in north eastern Spain (OK, I’ll say their name Barcelona), and they recently concluded a sponsorship deal for 5 years worth £125million, yet Manchester City, a team with a fraction of Barca’s fan base and heritage of success on the pitch, “negotiated” a £400million deal over 10 years? The feeling is in financial circles that UEFA won’t be able to, or have the inclination to, enforce any punishment of transgressors of FFP till around 2018 and while clubs can be banned from UEFA competitions that is very likely to be a last resort. So where does that leave our beloved Arsenal, a club taking the implementation of FFP very seriously? In the opinion of this humble blogger we are perhaps a tad too mindful of FFP as we seem to be handicapping our development in anticipation of FFP being implemented both rigorously and on schedule. To not use the leeway of permissible losses in the next few years in our haste to be break even in advance of the date when it is required seems to be putting ourselves at an unfair advantage. However I do concede anticipating just how strictly UEFA will enforce FFP will be a task that I’m glad is not mine to wrestle with. Let’s put bitterness and recrimination to one side for a moment and accept that Samir Nasri is quite a good player. His close control is excellent, he can beat players for fun, he likes attacking the danger areas and he has an eye for goal. On average, based on last season, he’ll provide an assist once every 10 games, which made him an important player for Arsenal. Admittedly, not as important as Fabregas, Arshavin, Van Persie, Walcott, Rosicky and Wilshere, who all had more assists last term. He’ll also get you a goal once every five games, based on his scoring record for Arsenal, which isn’t bad. If he starts, say, 15 games for Manchester City this season he’ll notch up a grand total of three. He is effective out wide but, if given the greater responsibility of a central midfield role, is left badly floundering as we found out several times last year. I would have preferred him to stay at Arsenal because he is a decent attacking option, although far from being world-class. For some of the reasons outlined above, you can see why Man City bought the little Frenchman. They have been accused of having more graft than guile and, on his good days (which were few and far between when it really counted in the second half of last season) he has the skills to unlock an obdurate defence. But for the money spent on him, City might well have bought any one of several talented outside forwards (Juan Mata, Gareth Bale and Franck Ribery to name but three). 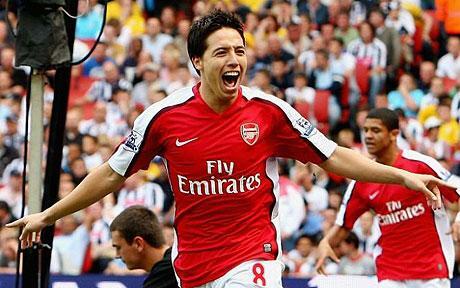 Instead they doggedly pursued Nasri all summer long (indeed from January, if some reports are to be believed). In my mind it raises a question. City have the resources to buy anyone, so why spend so much effort on a player who has been not much above average apart from one purple patch that lasted less than half a season? They don’t really need his footballing gifts. It’s not like he’s a game changer for them (as Aguero may turn out to be). City are embarking on this season with aspirations, of course, to become champions of England. But also with a pragmatic ambition to, at the very least, stay in the Champions League with a top four finish. If Financial Fair Play proves to have any teeth, City will need ECL income if they are to continue to compete at the top-level (and pay the stratospheric wage bill they have accrued). So, to my mind, a crucial element in their move for Nasri was to weaken one of their rivals for the top four slots: namely, us. I suspect the same motivation behind their acquisition of Clichy, too. In a summer when everyone in the know in football was aware that Cesc was undoubtedly leaving Arsenal, I believe the temptation to kick us when we were down was too much for City to resist. Mancini must feel that he has severely weakened Arsenal, and in the process gained yet another decent squad player in Nasri. Money, of course, is no object. I’m not going to criticise City for it. It’s great tactics – and Machiavelli (no, he didn’t play with Mancini at Sampdoria) would certainly approve. 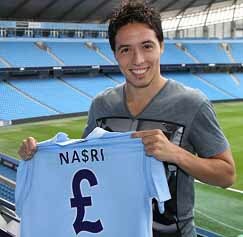 The funny thing is that I think the Nasri move will backfire. He is clearly a disputatious fellow, as his arguments in the French camp and in the Arsenal dressing room give testament to. He will bring that attitude to Eastlands, and may well leave behind a more united team at Arsenal. Certainly the spirit shown in the games against Udinese and Liverpool indicates that something positive is happening at The Arse. However good the individuals were in our squad last season, they had collectively developed a losing mentality. The departures of Nasri, Clichy, Cesc and others have given us the chance to shake up the mood in the squad, bringing in new players not tainted by that negativity. We won’t really miss the error-prone Clichy (top professional though he was for us) and Gervinho already looks like a more than capable replacement for Nasri – and that’s before we’ve even seen anything of Ryo and Oxo. I may be wrong. Nasri may have a storming season for City. If he does I will not wish him well, because he has moved only for money and has shown a lack of class in his comments about his former club. But it’s more likely City have Adebayor Mk II on their hands, and they’re welcome to him.